Try teaming a black wrap dress with a Bao Bao Issey Miyake phase faux leather wristlet from Nordstrom for an easy to wear look. Sporting a pair of black suede heeled sandals is an easy way to add extra flair to your getup. We're all ensembleing for comfort when it comes to dressing up, and this combination of a tan leopard fur coat and a Bao Bao Issey Miyake phase faux leather wristlet is a great example of that. Sporting a pair of red suede pumps is an easy way to add extra flair to your getup. We all seek comfort when it comes to dressing up, and this combination of a gold sequin sheath dress and a Bao Bao Issey Miyake phase faux leather wristlet from Nordstrom is a practical example of that. Got bored with this ensemble? Enter red suede pumps to switch things up. Team a charcoal crew-neck t-shirt with a gold leather clutch for a lazy day look. And if you want to instantly up the style ante of your look with one piece, add silver leather pumps to the mix. 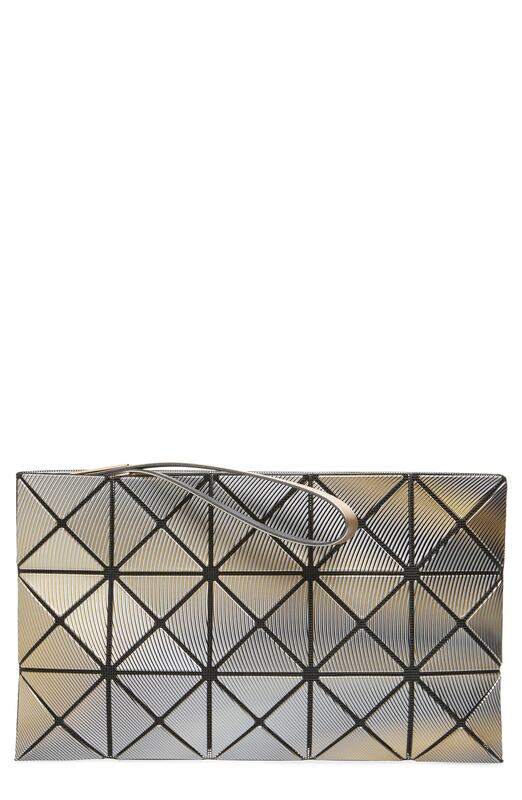 Consider pairing a dark brown crew-neck sweater with a Bao Bao Issey Miyake phase faux leather wristlet, if you want to dress for comfort without looking like you don't care. Wear a white lace crew-neck t-shirt and a Bao Bao Issey Miyake phase faux leather wristlet, if you feel like relaxed dressing without looking like a slob. Let's make a bit more effort now and rock a pair of black suede heeled sandals. We all seek comfort when it comes to dressing up, and this combination of a red satin fit and flare dress and a Bao Bao Issey Miyake phase faux leather wristlet is a vivid example of that. To add oomph to your look, complete with black satin heeled sandals. Team a black leather biker jacket with a Bao Bao Issey Miyake phase faux leather wristlet to be both cool and relaxed. To add oomph to your look, round off with black leather ankle boots. If you're all about relaxed dressing when it comes to fashion, you'll love this totally chic pairing of an orange embellished maxi dress and a Bao Bao Issey Miyake phase faux leather wristlet.